Sugar Rushed: Hot Chocolate Station! We had a few of the neighbours over last night for a little Bonfire party and via group chat I knew the grown ups were covered for wine but I wanted something special for the kids to drink. What is better than Hot Chocolate with all the trimmings on a winter night though, right?! I honestly haven't tasted better than this either if I do say so myself. 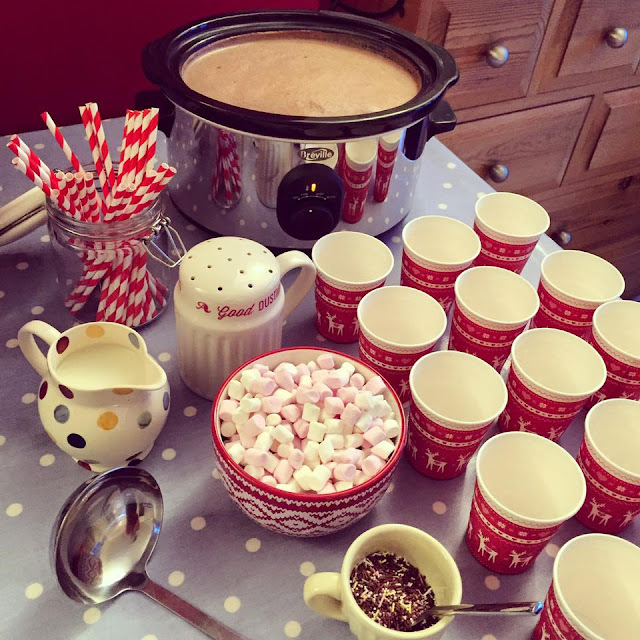 I didn't want to be standing in the kitchen making tonnes though, instead of enjoying the party so I decided to make a Hot Chocolate Station that ANY grown up could help to make. I have a bit of a thing for my Slow Cooker and its almost a challenge what I can make in it next. I made Mulled Wine on Christmas eve last year and that sparked this idea. I cant recommend it enough, even the Grown ups loved it, perfect for any winter party and we will def be doing this at our annual Christmas Eve party. Coco duster - I already had it. 1 small tub of Single Cream - I used half. A large scoop of Nutella. Put the full tub of the Cocoa Powder and a huge scoop of Nutella in the slow cooker....yip looks a bit like a lump of poop. I'm also immature ha ha. Then add the 4pts of Milk and half the tub of cream. Give it a really good stir with a wooden spoon, until combined. In hindsight a whisk would have been much better. Put the lid on, turn it on low for 2hrs and it will be delicious and piping hot ready for the guests. In the mean time I set everything else out ready for all the toppings and guests to help themselves. When ready give another good stir and use a ladle to serve up and top however you wish! What about those lush Mason jars with a handle for a more smart or Grown up party? A bit more grown up version? I'm in. 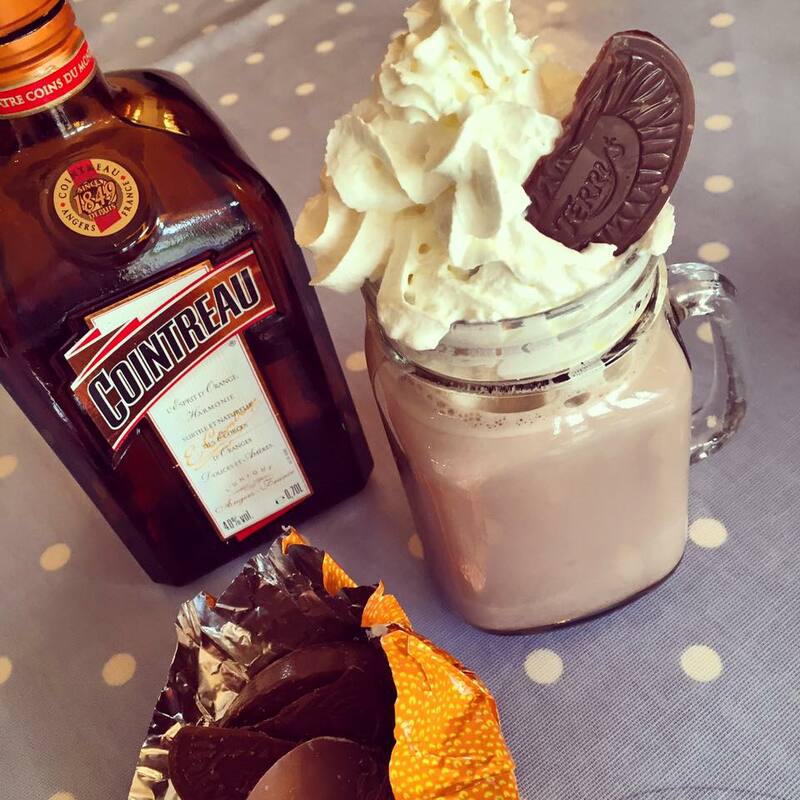 I lovvvve adding Cointreau to mine but I do have a major Chocolate Orange thing going on. Add the alcohol just before serving, stirring in well or add into the top of each drink. I would personally add a shot per person...it warms your bones in the winter right he he. However if you don't want it to over power just half the amount. So want to be a bit lit 9-10 shots. Just a Taste 4-5 shots. Malibu with some coconut sprinkles. Baileys with a little liqueur Choccy on top. GROWN UPS... 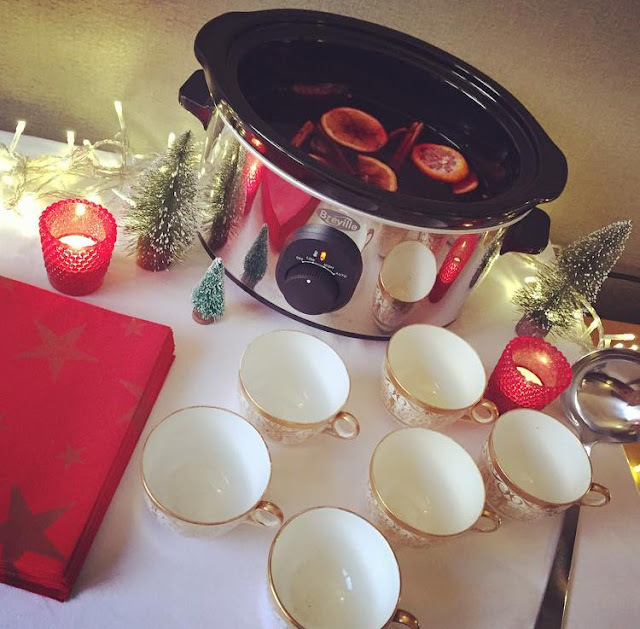 HERE IS MY MULLED WINE RECIPE! Thank you SO much for all the interest in this post...it is in its millions of views now which is just insane so thank you for that. I didn't expect it at all, so let me answer a few of y'all questions I didn't cover. Did I use Cocoa Powder or Drinking Chocolate? In this recipe I used Cadbury's drinking chocolate. In my opinion it's creamer for kids. I have used Cocoa before and it works but makes it much richer so more like a dark hot chocolate. You may also need to add sugar and I cant be doing with the guilt of that see how much goes in, at least in the drinking chocolate its all hidden and yummy already ha ha. What size is your Slow Cooker? Mine is a 3.5L. If youre's is too small for your party how about borrowing a few and have them all on the go? Last year I did but had This is one, Beef Stew in the other and Mulled wine in the third. PROMISE to get the recipe out in the next few weeks. Well normal Mug's it should be 10 but these little ones it did 15-20 I guess it depends how full you want them...obvs gotta leave a big gap for marshmallows and cream right?! Nope not for me. It needs a good stir when ready but it was fine for about 4-5hrs while it was made and served. Nuts - Allergy and cant use Nutella...I honestly feel for you its may favourite thing in the world! However what about using some other Chocolate sauce to add more Choccy flavour. I'm a big Slimming World fan and I love Choc Shot which is used a lot as its low fat, its even Vegan friendly. 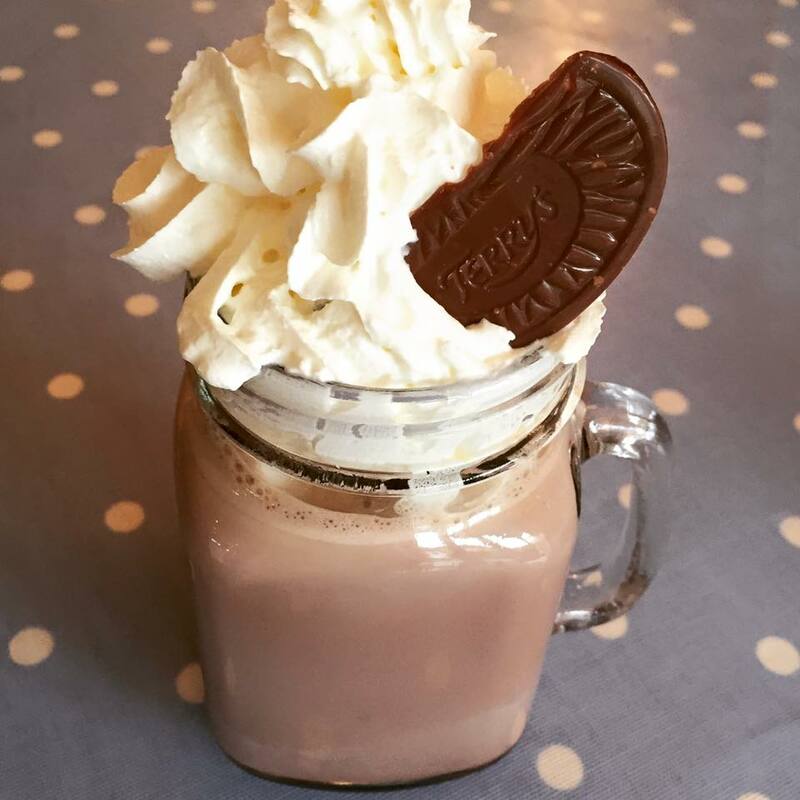 Milk - My son Oscar cant actually have cows milk so I have made this with his normal almond milk and it was great. Totally couldn't tell. As for the topping, instead of whipped cream what about a scoop of that yummy 'Marshmallow Fluff' the supermarkets have thankfully brought over from the USA. Not the healthiest but dairy free and this is a treat after all. If anyone try's Soya etc I would love to hear about it. Well I make it 2hrs before guests are due to arrive and it perfect and piping hot for then, people mingle then slowly help them selves so mine was on the go for about 4-5hrs. It did start to look a bit grey at the dregs so make sure you just stir it well each time before serving. I could say longer than that as its always demolished! Do you turn off the Slow cooker? Nope I just set it on low and leave until it is all gone....then I do obvs ha ha. Don't be telling me about no house fires, god forbid. To be honest you could turn it off and it would keep warm for about an hour I'd say. For your Own Slowcooker see below. What a fantastic idea....As well as it being great for the kids it just looks so pretty! This is just amazing - you are full of fantastic ideas! This may be a silly question, but I am not sure what Single Cream is. Hi sound a really good idea but could i ask one question. What size is your slow cooker? What a fab idea! Might try an after 8 version, add a couple of cap fulls of mint extract, it works on chocolate cake so worth a try on this! Love this idea! Does the milk curdle? Would love your mulled wine recipe, it's a fantastic idea !!!! Loved this we are going to use this at our schools Christmas Carol event, we have mulled wine for adults but the children will love this plus it doesn't need much looking after so more adults free to join in with carols!! Hey love this idea. 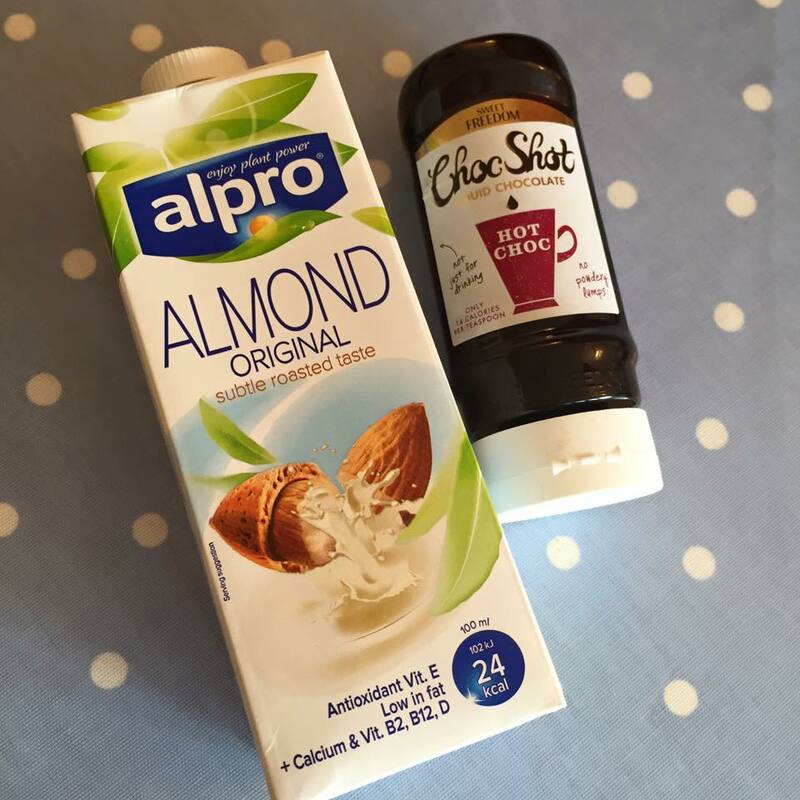 Can't wait to try :-) do you need to use the single cream or can you leave it out if you want a healthy version? Came across this on my FB feed!! Wow.....I love the pioneer woman and you are so ,I have like her, but British yeah !!! The pound land shopping gave it away lol. That is an excellent idea, think i will add Baileys to mine to make an adults hot chocolate. Totally need your mulled wine recipe! Question from California : Is there any added sugar in the cocoa? Great idea! Will be trying this Christmas time! Thank you for posting! Christmas in Bermuda is chilly too. But not as cold as most places! Love the addition of Cointreau! Does it work well with half the amount? Might try this for my teenagers get together..
Ohh, love my slow cooker but would never have thought of doing hot chocolate in it! With two small children who love it, it would go down a treat. I'd probably have to halve the amount though. Hey, looks incredible! Little tip when adding the milk/cream: don't dump all the liquid in at once!! As shown in the pic, awkward to mix and risks of lumps. Instead, add a little milk at a time into the powder, stirring until you have a choc paste. Then gradually keep adding all the milk and cream until its all mixed! Much easier :). This looks amazing. I might try it just for myself. Or, great excuse to have a party. Thanks for sharing. I'll be trying the hot chocolate for my family tomorrow hope it goes to plan looks amazing on pictures...thankyou for sharing your ideas...hope to see more. Hotel Pankaj is another of the good hotels in Trivandrum near the station. It is a 3-star hotel and is located at a distance of just 1.5 km from the Railway Goods Depot which makes you save on time as well as transportation costs. It is located opposite to the Government Secretariat, and close to major government, business and shopping centers in Tiruvantapuram. When it comes to weathering, most people only consider the trains and not the model train scenery. If you are purchasing scale scenery from a store, you will want to weather them as well in order to keep with the appearance. After all, it will look odd for the weathered train to be traveling through a pristine environment. If the train is traveling through the city, the train and the city should both look just as worn by smog and graffiti artists in order to make it look as real as possible.